One of Activision's big fall games is a revival of its open-world True Crime series, the closest thing the publisher has to a Grand Theft Auto. At least one part of the game that I saw at E3 had me thinking more Assassin's Creed. And I'm not talking about the part on motorcycles. True Crime: Hong Kong revives the Activision series via development studio United Front Games. 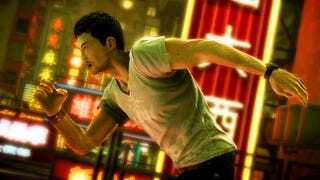 They've got a lead character, undercover cop Wei Shen, running through virtual Hong Kong in an adventure that involves his efforts to embed himself in the Triad organized crime underworld. While undercover, he must commit acts of (grabbing press sheet so I can quote it) "theft, extortion, drug running, smuggling guns, shaking down informants, kidnapping, human trafficking and more." Crime is guaranteed. But is any of it true? I'm guessing no. As I mentioned, the demo I saw of the game at E3 made me think of Assassin's Creed in parts. It didn't make me think of Grand Theft Auto, despite that being a point of reference for the earlier games. The action I saw was on-foot and on-motorcycle and involved a population density that made car-jacking seem unimportant. Two parts of the game were shown. The first had Wei Shen interacting with people in the crowded sidewalks and streets of Hong Kong. A developer noted that they believe it should be as easy for their game character to talk to a person as it is to shoot them. With that philosophy they are developing a "face" system for the game that will allow you to engage with more and more people in the city and to gain new ways to interact with them (I don't think we're talking about "tell joke" or "ask where they bought their shoes" type of interactions; more like "intimidate" and "group intimidate"). Whatever talking there was in the early part of the demo swiftly gave way to a chase. This was the Assassin's Creed bit. Wei Shen was the chaser. Some other guy was the chase-ee. The camera followed Wei Shen as one of the True Crime developers had him run through crowds of pedestrians, knock through crates of fruit, climb fences, scramble up a neon sign and dart down alleys. At the end of the chase, Wei Shen was surrounded by people who didn't like him. Thankfully, the game arms the player's character with martial arts moves. Imagine one hero beating up many bad dudes, hand-to-hand. That was the skirmish. The second part of the demo involved a motorcycle chase. That's what I have in my notes: motorcycle chase. Plus shooting. Sorry, the notebook page has nothing else other than my hand-drawn illustration of a meter that appeared in both parts of the demo, a semi-circle that represents the amount of "face" that Wei Shen has. This meter can go up and down and unlocks the intimidation aforementioned abilities as well as some others including a quick-heal. The idea is that players will want to manage their behavior in the game world in order to have the maximum number of abilities available. The developers didn't offer more detail than that. My look at True Crime: Hong Kong was brief, but hopefully these details help. Look for more on the game as we get closer to the fall, when the game is released on the PS3, Xbox 360 and PC.